What does lye heavy soap look like? I want to show a photo from a well known book.This is Norma Coney’s book, The Complete Soapmaker. You may have a copy. The photo on page 32, as shown here, is the perfect example of what NOT to make. 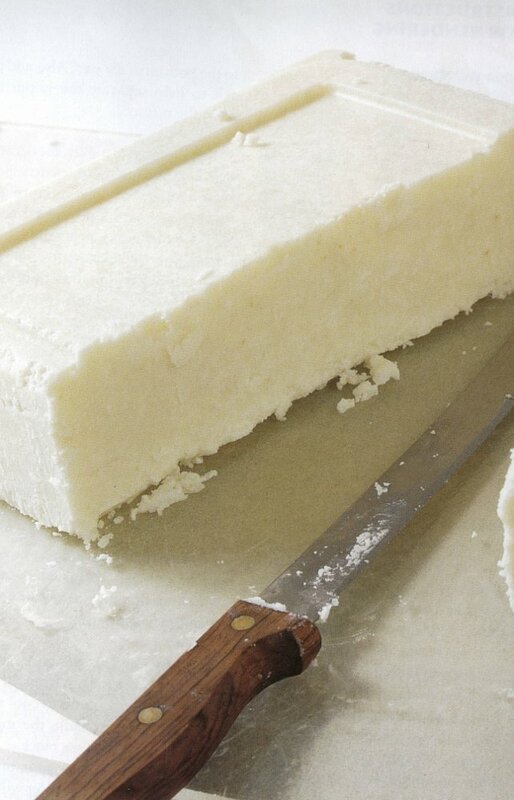 This soap is crumbly, chalky and has an uneven color in specs or flake form throughout the soap. If your soap looks like this, STOP! Go back to your recipe and re-work it through your mind. What happened? Did you weigh the lye twice? Go to 2.4 instead of 2.2? You need to review, step by step, what happened in the soap and making process. Overall, I don’t recommend this book. There is no point in reworking soap unless you have to. Want proof of our reasoning? Please give us ONE example of a cake that gets made twice before you serve it. Not formed into another dessert like tiramisu, but a cake that is baked, wetted, remixed, and rebaked. We can’t think of a single one. A cake? A cookie? Not even biscotti has a double mixing. A salad? Our feeling is: if you can’t do it right the first time, why waste your time doing it over? You will never get those life minutes back. Call Now! Support the “I will never rebatch again” fund. Operators are standing by! Page 32 of The Complete Soapmaker. The cover of The Complete Soapmaker. So… what I’m hearing you say is, If I have little dark specks in my soap then I have to much lye in that particular batch and to just toss it and start over by first reworking my recipe, correct? Dark specks can be many things, particularly botanicals. The photo has dark oil spots, which are much different than DOS (dreaded orange spots). The orange spots are oils that are oxidizing, turning rancid. The speckled look we don’t want looks like tapioca pudding (white areas with some that are semi-translucent, an obvious different shade). If the batch looks like the photo (crumbly, white rice/tapioca pudding) then it is time to rebatch and RETHINK the process the original soap went through. Rebatching is fine to save a batch. I hate to throw away any soap. Rebatching as a requirement to make soap is silly. 🙂 Sign me up!! I also have that book and have wondered about that photo. The soap looks so yucky! Thanks to your showing us how to save a batch of soap, I am hopeful that I will never again have to re-batch- I really don’t like the way the soap looks when it is rebatched! Another question:Do you recommend adding fragrance oils and colorants to warm oils before mixing in the lye solution? You can add colors early or late. Premixing the colors into a carrier will help get even dispersion. If you add dry colors late they can fail to mix into the soap evenly and this can cause alarm upon use (ACK! What is that dark streak on my leg? ), which we don’t want to occur. Both methods are acceptable. The goals is even dispersion of the color. Te he he. I will never rebatch! Too much work. I have the book, though. I like the photos. And I sometimes get inspiration for additives for my soap. But I never use her recipes. Sorry for posting this here, but I couldn’t find a suitable place for it: Regarding KOH and your lye calculator – how do I account for the purity of the KOH? The only sources I can find say that it is 90-93% pure, unlike the NaOH that I use, which is 100%. Do I have to adjust by 7-10%? Sodium hydroxide varies from 95 to 97%, unless in a liquid solution. This is normal. The cans of lye you find that say 100% don’t reflect the purity of the lye itself, just that there is not another additive in the can. Don’t make any further calculations for the KOH, just proceed with the batch of soap. I think you will find the finished soap to be lovely. Andee – thnaks for the reply on vaseline/mineral oil/silicone, etc. I haven’t used those for years and sort of forgot. I don’t remember them being great but will go back at it again. you’re great for being so responsive. We all really apprciate your personal attention. I would rematch and add the oil. Do it today, don’t wait. Don’t use it for laundry. I am so relieved! A weight has been lifted! 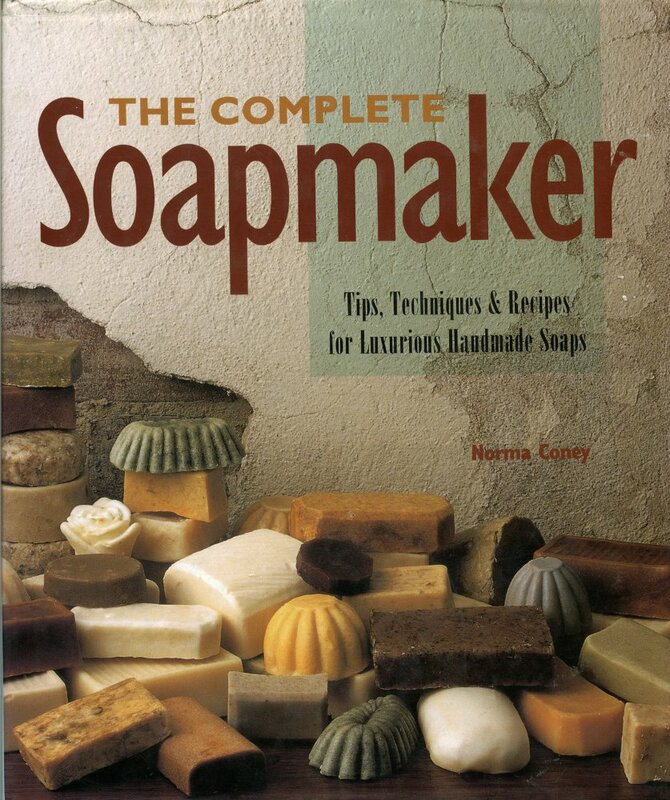 I have this book and was convinced that I must mill my soaps. I’ve hated every second of it! I was worried that the soaps I’ve made that did not first start as a milled batch must be damaging my additives and scents. Doesn’t seem to be the case. Dear Heather, weightless Heather, welcome to the club! !